Product prices and availability are accurate as of 2019-04-19 00:50:48 EDT and are subject to change. Any price and availability information displayed on http://www.amazon.com/ at the time of purchase will apply to the purchase of this product. This Certified Refurbished product is tested & certified by Breeadman to look and work like-new. The product includes all original accessories, and is backed by a 2 Year warranty. 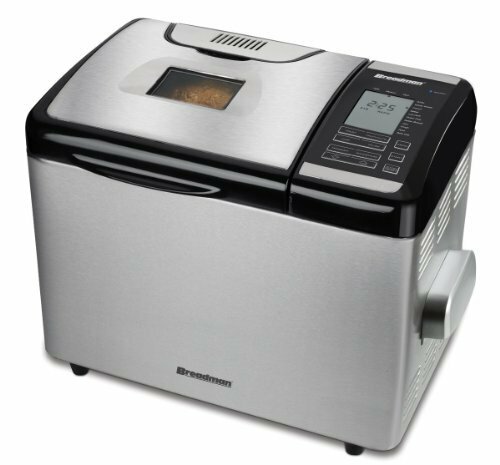 Automatic fruit and nut dispenser; viewing window; convection fan for excellent results Stainless-steel programmable breadmaker bakes 1-, 1-1/2-, and 2-pound horizontal loaves Measures 18-3/5 by 11-1/5 by 15 inches Nonstick baking pan; digital display; 24-hour delay timer; 1-hour keep-warm cycle. 100+ baking options; 16 settings including low carb and gluten free; crust color control.